When Cao Zhen's blood is three or less, he can use X additional attacks. When his blood is two or less, he can use cards with the the number X as wine. When his blood is one or less, he can use any hand card with the number X as duel. X is the number of health that Cao Zhen is missing. 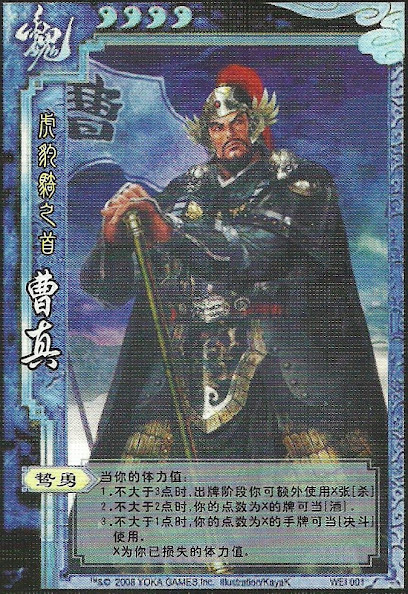 If Cao Zhen is king with a maximum health of five, he does not get any abilities since he has four health. The calculations for X will be different however. The measuring for X occurs whenever a card is used. If Cao Zhen takes damage, X changes immediately.